Over the past two decades, robotic planetary exploration has generated an incredible wealth of knowledge about our neighbors in the Solar System. We now realize that celestial bodies within our reach can provide resources such as water, minerals, and metals, essential for sustaining and supporting robotic and human exploration of the Solar System. It is only matter of time before “living off the land” exploration enabled by in-situ resource utilization (ISRU) becomes a reality. The Solar System offers almost unlimited resources, but the difficult part is accessing them. Thus, if the cost of mining and processing can be reduced, some of the minerals that are in high demand on Earth could in fact be brought back and sold for commercial gain. In general, there are at least three bodies that have been seriously considered for resource exploitation. These include our Moon, Mars, and near-Earth asteroids. The Moon offers resources that could be used in-situ (such as water), and because of its proximity to Earth, other resources (especially rare Earth minerals) could be returned to Earth and sold. Resources on Mars could be used to sustain a human (and robotic) presence, and to fuel launches back to the Mars orbit and to other destinations. Asteroids are relatively easy targets because of their low gravity well, but the micro-gravity environment makes mining and mineral processing extremely challenging. Knowledge of the vast resources in space has triggered an explosion of interest in space mining. Knowledge of the vast resources in space has triggered an explosion of interest in space mining, especially over the last few years. NASA is working on several feasibility studies and architecture concepts for resource utilization from the Moon, Mars and asteroids. (Honeybee Robotics is contributing to some of these, including the Robotic Asteroid Prospector.) In 2009, NASA’s National Commission on Space study (PDF) argued that extracting resources from the Moon and asteroids will be essential for further space exploration and colonization. Private firms have jumped in with the goal of bringing space riches down to Earth. 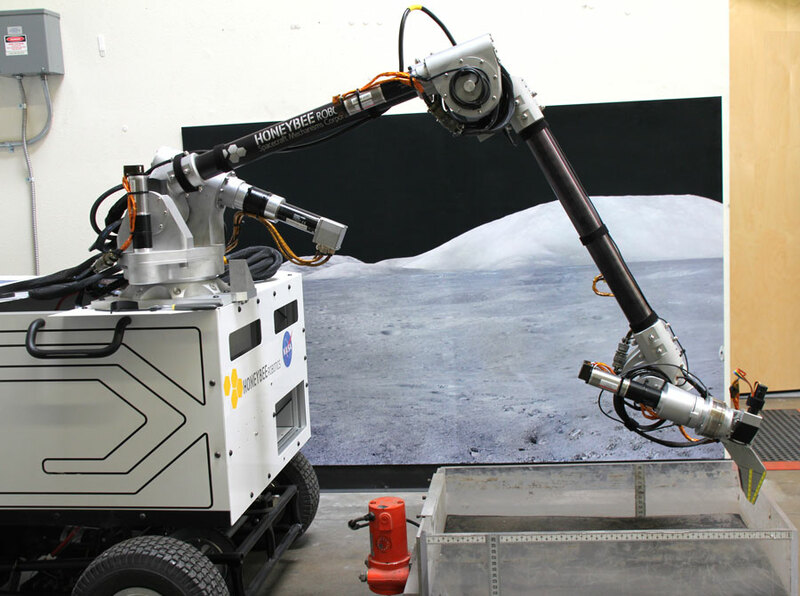 And with contests such as Lunabotics and the NASA Sample Return Challenge bringing new talent into the sector, training and education have expanded significantly. Mining and mineral processing in a vacuum — and especially in a reduced gravity environment — is difficult to imagine in the abstract. At this point, many risks are simply not addressable with the amount of information we currently have. What’s Honeybee’s role in this? We’ve been working on space mining and resource processing technologies for the past 25 years, providing feasibility studies, systems analysis, unique solutions and technologies, hardware development, test results, and flight systems for NASA and other space partners. Some of the approaches could be applied to both the Moon and Mars, but asteroid mining, because of the extremely low gravity field, is in its own category. Potential technologies would have to be thoroughly tested before they could be integrated into the asteroid mining spacecraft. Of course, the only true way to test new technologies is on a mission itself! The Keck Institute for Space Studies (KISS) recently determined that it would be feasible to bring a 7 meter, 500-ton asteroid near Earth by 2025, with asteroid identification, capture and return costing on the order of $2.6 billion (PDF). Such an asteroid parked at the Earth-Moon Lagrange Point would be an ideal testbed for new space infrastructure, proximity operations, space mining and resource processing technologies. And while there are many challenges to a successful space mining program (economics, fuel, human safety, etc. ), one of the biggest hurdles is physically mining and processing materials in the extreme and unstructured environment of space. It is like nothing we encounter on Earth. When it comes to physically collecting samples, especially in quantities beyond those needed for scientific analysis, designers face several challenges. Some risks such as proximity operations, landing, and traversing are easier to understand and model, and hence these risks could be quantified. However, mining and mineral processing in a vacuum — and especially in a reduced gravity environment — is difficult to imagine in the abstract. At this point, many risks are simply not addressable with the amount of information we currently have. In addition, the kinds of materials to be gathered, their location, the volumes needed, on-site processing required and the end use of the materials must all be clearly defined in order to develop the mining strategy and the overall system architecture. Mining in space is challenging but realistic … and if we ever want to get serious about human exploration and colonization of the solar system, there’s no alternative to gathering local resources for fuel, water and construction materials. In this respect, space mining may be the ultimate high-risk, high-reward robotic initiative. Current materials acquisition and analysis systems are best suited to sampling and surveying objects of interest. Any viable mining mission relies on a comprehensive understanding of the chemical makeup and physical properties of the site early in the process. After gaining a technical understanding of the composition and material properties of the resource lode, larger-scale mining efforts could begin with spacecraft tailored to the given material. In terms of supporting settlement on the Moon or Mars, this would entail special tools and autonomous vehicles designed to gather regolith, ice deposits or other materials useful to habitation. Many astroid mining programs seek to extract useful resources (such as precious metals) and return them to Earth, and keep other resources (such as oxygen, hydrogen and water) in space to power future human exploration. Given the complexity and constraints of drilling and mining in progressively more extreme and difficult-to-reach environments here on Earth, mining in space is challenging but realistic. And if we ever want to get serious about human exploration and colonization of the solar system, there’s no alternative to gathering local resources for fuel, water and construction materials. 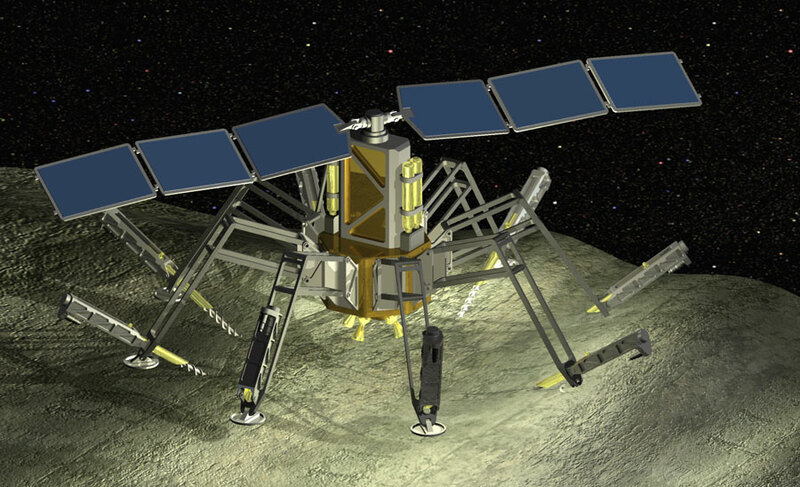 In this respect, space mining may be the ultimate high-risk, high-reward robotic initiative. We’re not starting from scratch. Much of this technology is based on sample collection and analysis work that the space community, and Honeybee Robotics, has been working on for decades. Over the past 25 years, Honeybee has built over fifty sample acquisition, excavation, mining and processing systems; we’ve made ten of these devoted to acquiring cores for analysis, such as envisioned for the Mars 2020 mission. The following are a few examples that represent a breadth of unique space mining technologies. Current plans for NASA’s Mars 2020 mission are based on the Mars Science Laboratory landing system and vehicle platform, with enhanced tools and capabilities. Mars sample return is one capability NASA is exploring. Here, Honeybee demonstrates its expertise in planetary drilling, core sample acquisition, and sample caching with an architecture for a sample return mission. The 1-meter class Mars drill, LITA, during field testing on Carnegie Mellon’s Zoe rover. Honeybee’s next-generation space drill, LITA, is designed to reach more than 1 meter deep into Mars, Europa or other bodies in the solar system. The drill has performed successfully under Mars pressures in analogous environments, including the Arctic and in Antarctica. 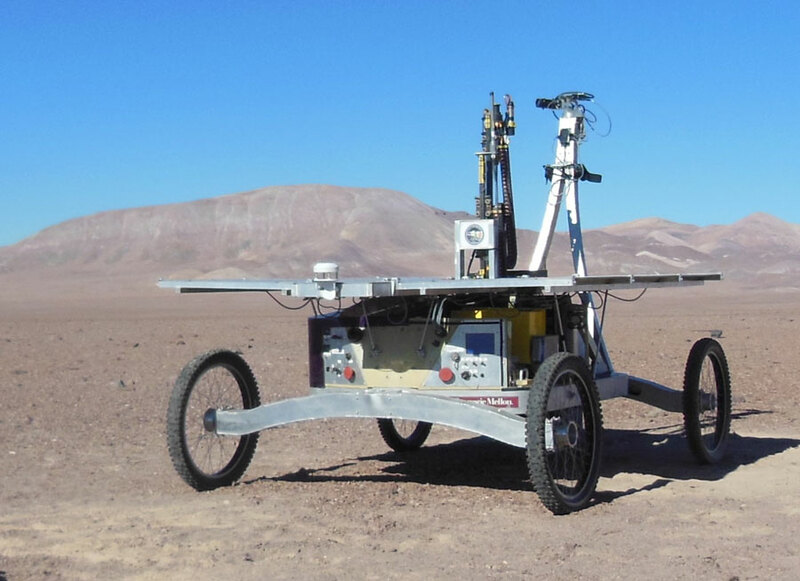 Here, it’s shown deployed on the Zoe rover built by David Wettergreen’s team at Carnegie Mellon University, where it is gathering subsurface samples from the Atacama Desert in Chile to test for signs of life. The Auto-Gopher drill, designed for deep planetary drilling from a small platform. The Auto-Gopher drill is a wire-line rotary-hammer drill, whose depth of penetration is limited only by the length of the wire that suspends it. This enables drilling at great depths, beyond the reach of traditional or telescoping drill architectures. The drill has been successfully field tested in gypsum, which offers conditions similar to that of water-ice at low temperature. 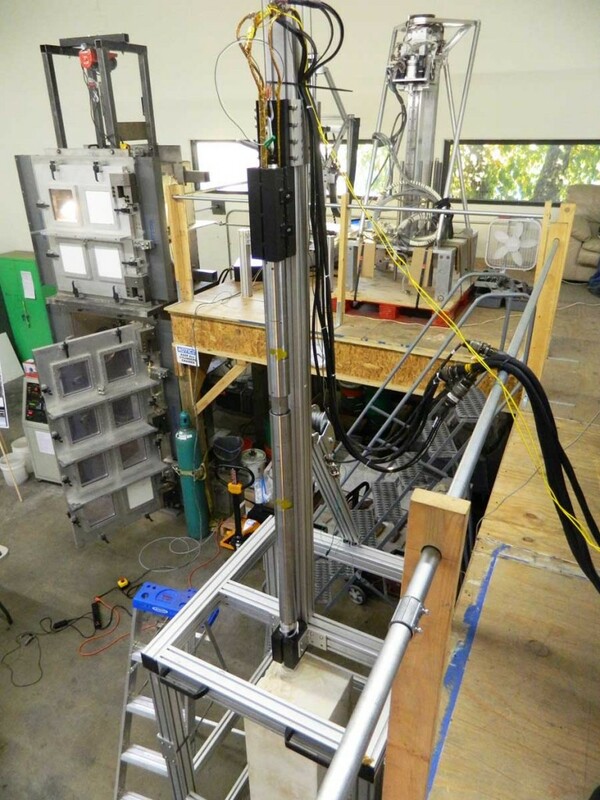 A 2012 field test showed the drill capable of capturing 32 cores down to a depth of 3 m, with cores pulled every 10 cm, over the course of 10 hours. Integration with in-drill sensors would enable in-situ analysis of deep subsurface geological and environmental characteristics. The concept Asteroid Water Extractor, designed for reconnaissance and resource collection. The Asteroid Water Extractor system concept gathers water from asteroids within tight mass and power constraints, making it an ideal system for early in-situ resource extraction in support of human spaceflight. The configuration of drills located on each lander leg adds redundancy and helps maintain down-force in a microgravity environment. Water collected from the icy dirt is removed and stored for later use. 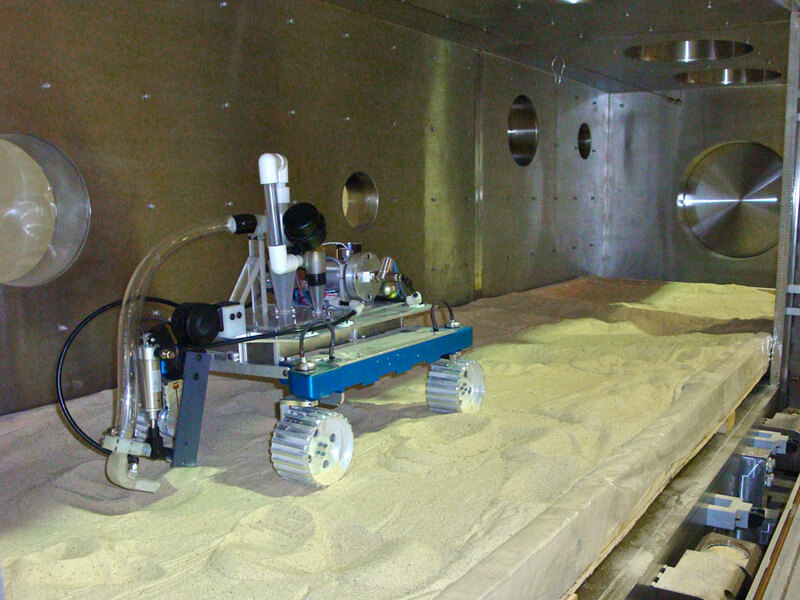 A functional prototype of the pneumatic mining system in Honeybee’s vacuum chamber. Pneumatic excavation is an emerging technology that uses gas to mine and transport regolith. Initial test results have shown that one gram of pressurized gas can loft almost 6,000 grams of soil under lunar-like conditions (low gravity and in a vacuum). The excavation gas can be carried in liquid form in a designated tank, generated on site by burning residual propellant in the lander, or even generated as a byproduct of the ISRU reaction process. Because the pneumatic system has no moving parts, it is ideally suited to the lunar environment, where pervasive and highly abrasive dust introduces opportunities for mechanical failure. Modular percussive excavation technology reduces down-force needed by a factor of 40. Because many mining targets, such as the Moon and Mars, have just a fraction of gravity compared to the Earth, mining and excavation systems must not rely on large down force. Percussive excavation uses vibration or hammer action to reduce required digging forces by a factor of 40. This in turn reduces the mass requirement of the lunar excavator. Because every kilogram of Lunar mission payload adds approximately $100,000 to mission cost, this technology offers billions of dollars in savings. This is a flexible, modular technology that can be mounted on a variety of handheld tools or autonomous vehicles for maximum operational flexibility.